Best Cyclists' Deodorant: Thailand’s crystal deodorants carrying brand names such as Grace and Oriental Nature. They work, are light, small, cheap and last for ages. Available at pharmacies. 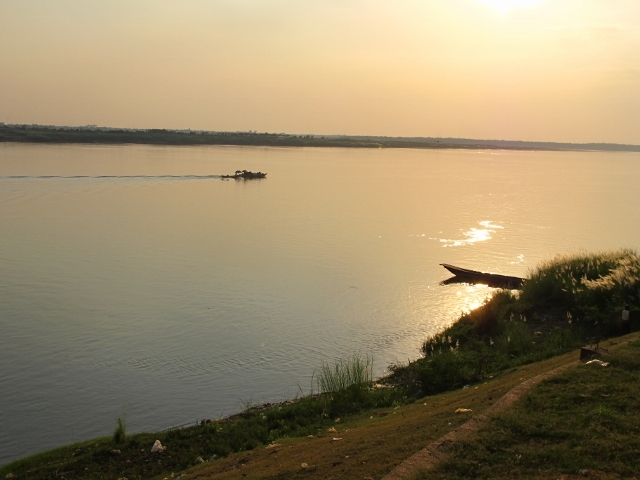 It’s been a kind of homecoming – in Cambodia of all places. Sam (Mike’s 27-year-old son) has joined us with a bicycle. The last time we spent any length of time with Sam was when he was in his mid- teens, and we took him sailing in Tonga. Five years ago he moved to Australia and we’ve seen very little of him since. An initial setback with a flattie on the second day. Help wasn't far away. He was doing what all young men (and probably women) need to do - getting away from their parents’ and learning to stand on their own two feet. 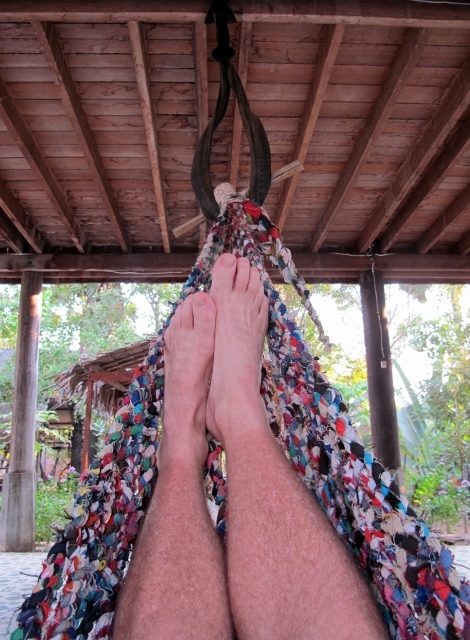 He’s changed cities and jobs and girlfriends and saved enough money to set out on his long-held desire to travel. He’s also grownup, and the very best part is that parents and “reconstituted families” are now ok.
Until it happened, we never really believed Sam would accept our invitation to come cycling for a few days, a few weeks or whatever. 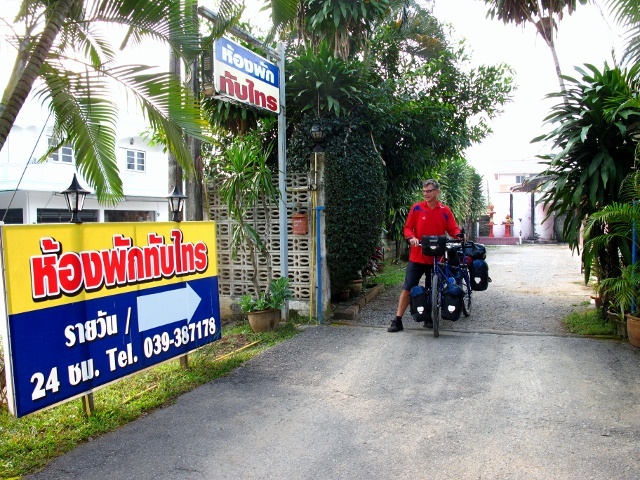 As Judy said, she thought he would get a better offer as he travelled through neighbouring Thailand, probably one involving new friends and lots of late nights. But Sam surprised us. 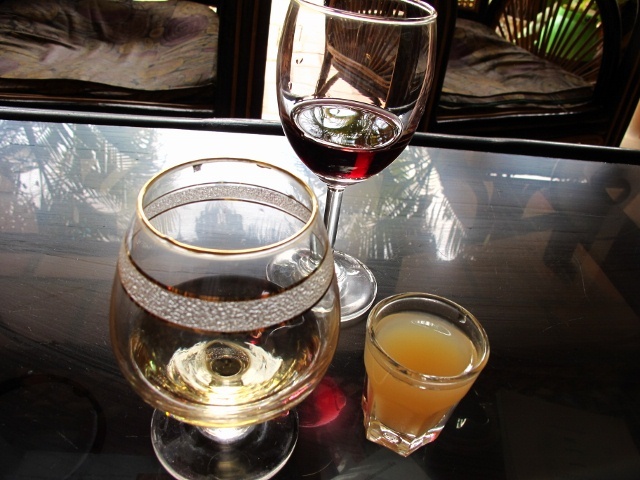 He turned up bright as a button on the due date in Siem Reap and before we knew it he was drinking beer with us in the little restaurant attached to our guesthouse. We spent a couple of days tracking down a bike for him, one that wasn’t too expensive but was sturdy enough to tackle the roads to Phnom Penh and beyond. He settled on a used mountain bike that appears to have been made in Japan. It has no complicated disc brakes or suspension, but does have 21 gears which are stamped with the magic word Shimano. Sam and Judy - on the road between Siem Reap and Phnom Penh. 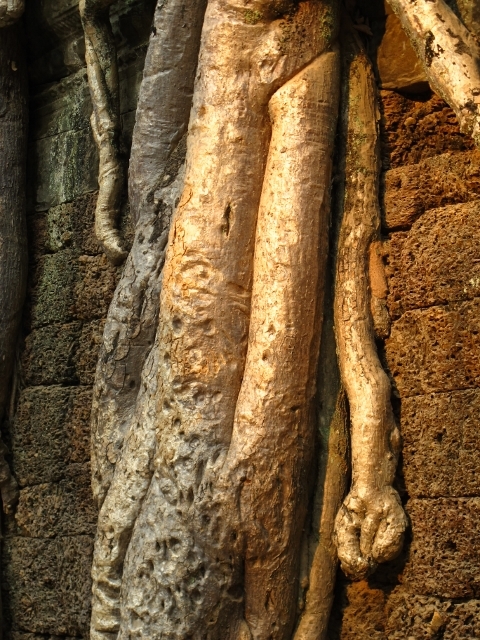 Peam Chi Kung, north of Phnom Penh. 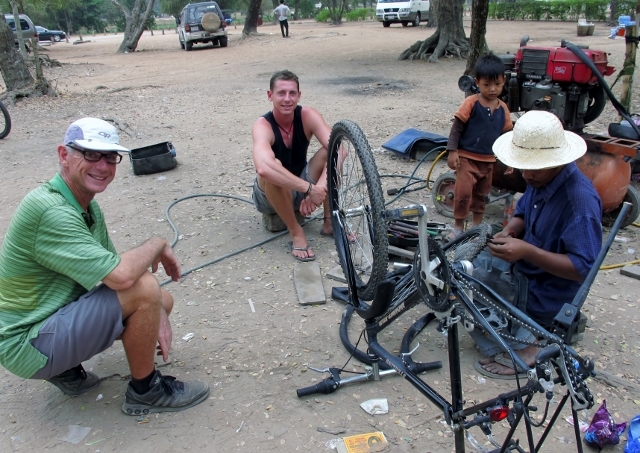 So far, so good, until the next day as we toured the temples of Angkor Wat and Sam had his first flat tyre. It wasn’t a promising start but luckily a roadside cycle mechanic replaced both inner tubes for next to nothing. 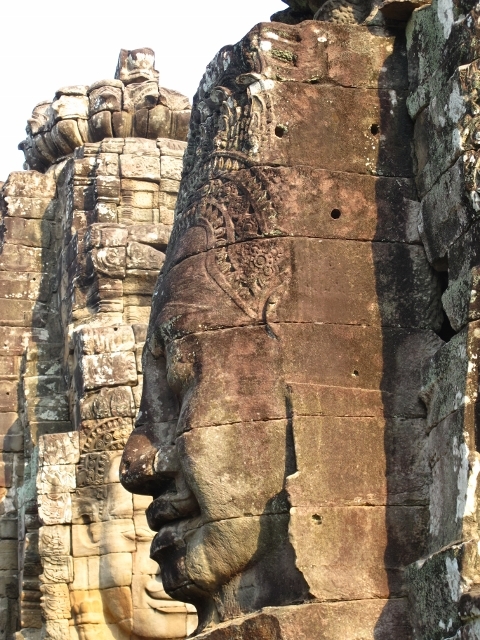 Tourist checks out temple art near Angkor Wat. Now, 400 km later, we are in Phnom Penh. Sam’s bike - touch wood - is running well and has even been given a name, Morris. Sam is enjoying the cycling so much he is considering keeping the bike once he leaves us. Most importantly, the three of us have been catching up properly for the first time in years. It’s felt like a celebration - a homecoming. It’s perfect. S-21 detention centre under Khmer Rouge rule. 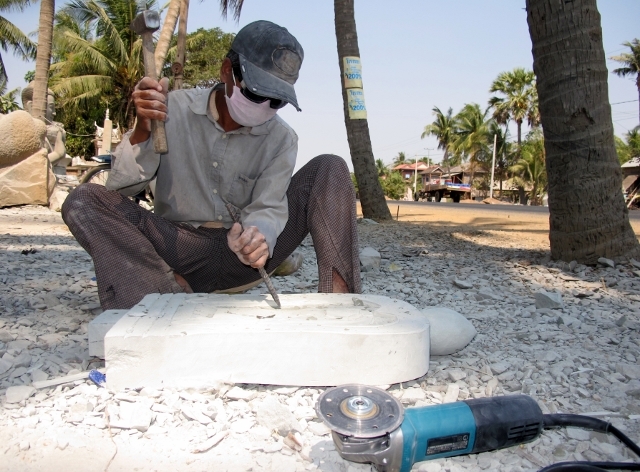 Stonemason at work at Kakaoh. 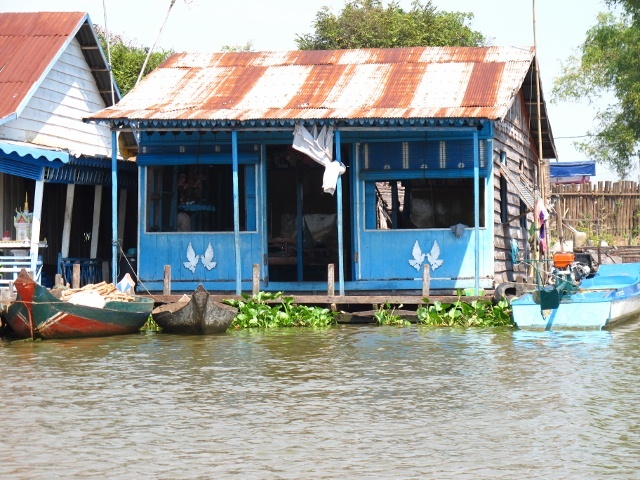 this one on Highway 6 to Phnom Penh. dog takes an unnecessary interest in us. We cycled into a nation in mourning, where television sets were broadcasting live pictures of a very dead man. Former King Norodom Sihanouk died in October last year, and his embalmed body had been lying in state in Phnom Penh ever since. 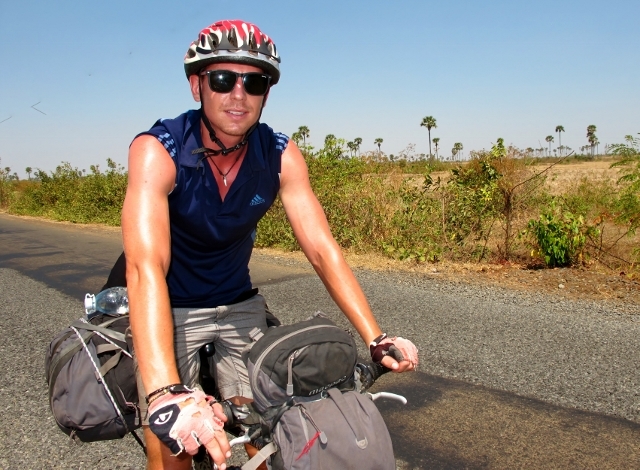 For touring cyclists though, the news is sometimes slow getting through and as we crossed into Cambodia from Thailand we had no idea what was going on - that the country was saying its final farewell before the funeral pyre was set alight. 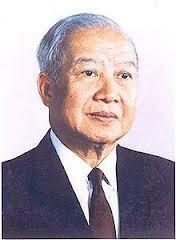 Sihanouk was a complex figure. He negotiated his country’s independence from France in 1955 but backed the Khmer Rouge, responsible for the deaths of an estimated two million Cambodians. In later years he was seen as a peacemaker. were not allowed to broadcast entertainment programmes. We arrived at the Ban Pakard – Psar Pruhm border crossing after a morning’s ride through some of the nicest countryside we’d seen in weeks. 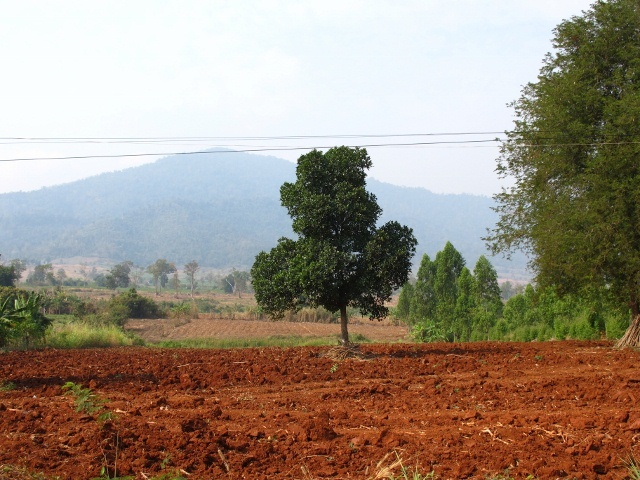 The land was undulating, green and with a hint of mountains through the background haze. It was 30 km on a good road from our overnight stop at Pong Nam Ron to the border and we crossed with a minimum of fuss and none of the touts and scammers we’d heard operate further north at Poipet. on the right as you head out of town. 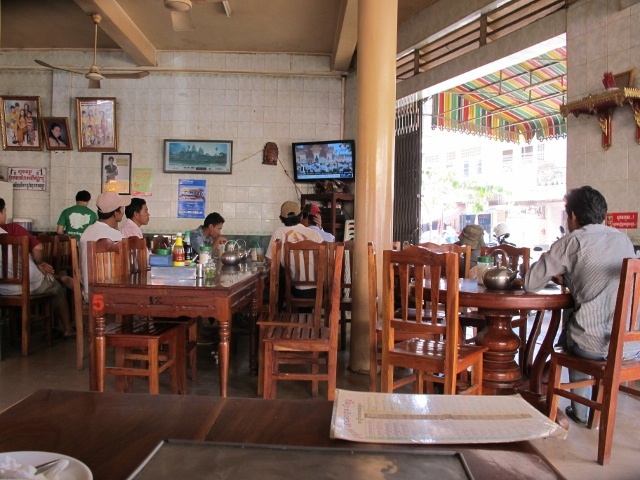 At the restaurant where we stopped for lunch just inside the Cambodian border the young staff were glued to the tv set watching that live broadcast. We had to ask who had died. A young man wearing a black ribbon explained it to us, at the same time handing another black ribbon to his friend. Sihanouk was cremated in a 15-storey purpose-built crematorium alongside the Royal Palace in Phnom Penh. The heat hung over the land as we cycled on. There was less green and more brown and soon our water bottles were nearing empty. 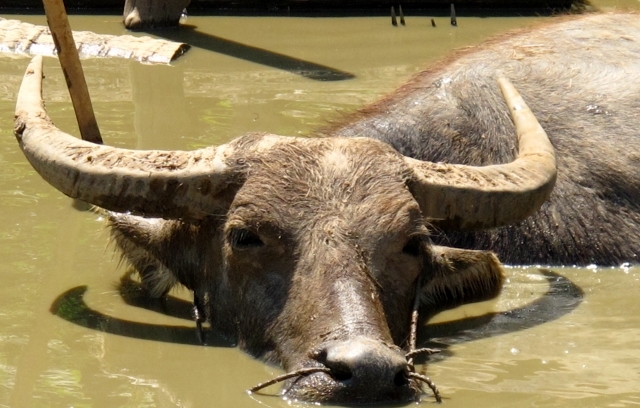 The differences with Thailand were striking. The houses were more dilapidated, the people more ragged, and the farm machinery more antiquated. 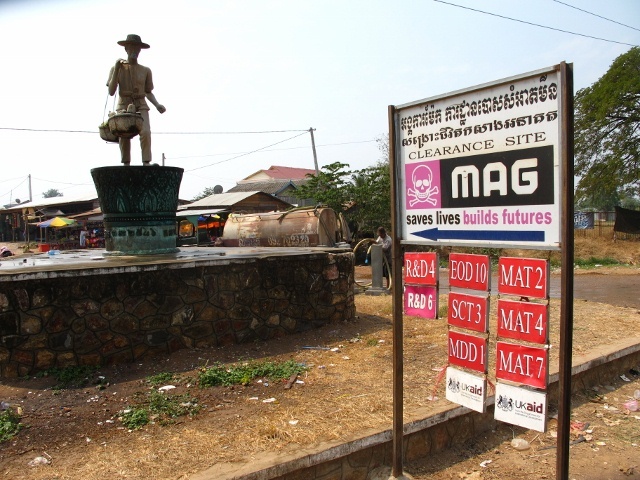 Roadside signs showed where teams had been clearing landmines. 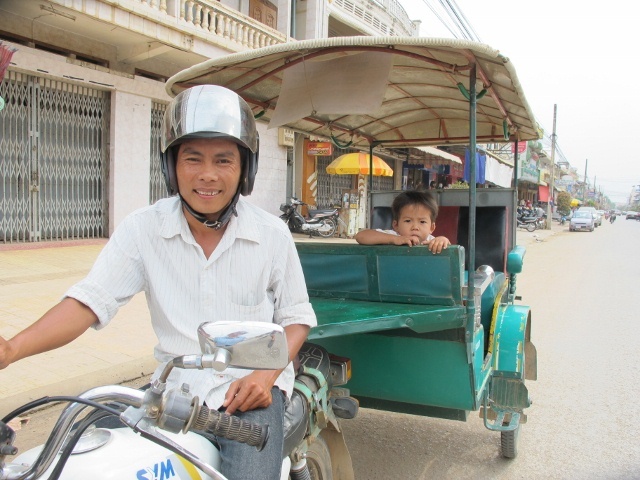 It’s estimated there are 40,000 amputees in Cambodia, all victims of landmines. From time to time we could hear the live broadcast coming from the houses we passed, the same discordant music. 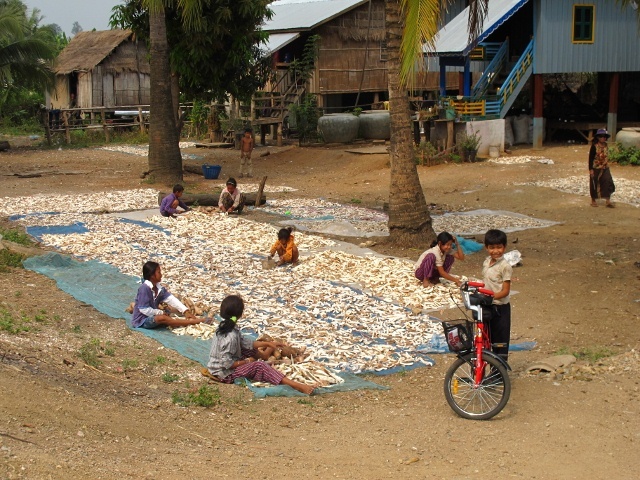 Cassava chips drying in the sun. We stopped for the night at Pailin, 22 km inside the border and reputed to be home to some of the retired big guns of the Khmer Rouge, responsible for the deaths of an estimated two million of their fellow countrymen during the late 1970s. 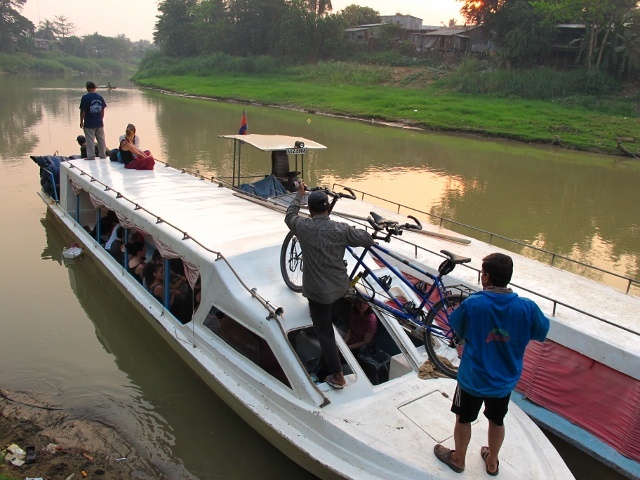 Fellow cyclists, near Battambang, Cambodia. 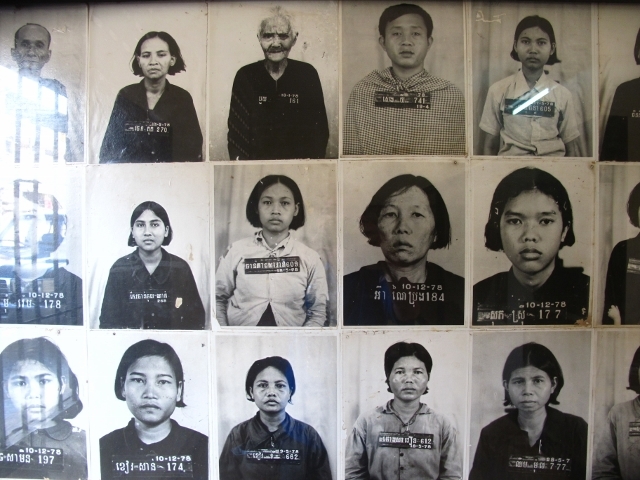 The Khmer Rouge Tribunal which is attempting to dispense justice to some of those responsible for the atrocities has been fraught with problems. Initially there was argument over the makeup of the Tribunal, then concern that some of those charged would die of natural causes before their cases were heard. Now the Tribunal is facing financial difficulties and some staff are threatening to walk out unless they are paid. In the dark we traipsed along a dirty, scruffy road to the only passable restaurant we could find. A tv in one corner was screening a rerun of the day’s funeral proceedings. An elderly woman wearing dark glasses watched intently and reached for a tissue to wipe her eyes. The next morning an ATM threatened to swallow one of our plastic cards, then relented and spat out our US dollars. It was just as well as we couldn’t have sought help from inside the bank. A sign said it was closed for four days as a mark of respect for the Father King. Later we learned the schools were closed as well. 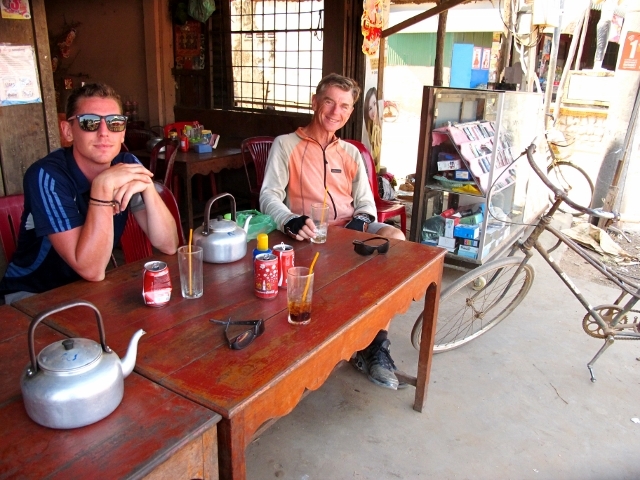 A headwind held us back during the 85 km ride to Battambang and we arrived tired and dirty. That night’s tv viewing in a restaurant was more of the same, but this time hardly anyone was paying attention. 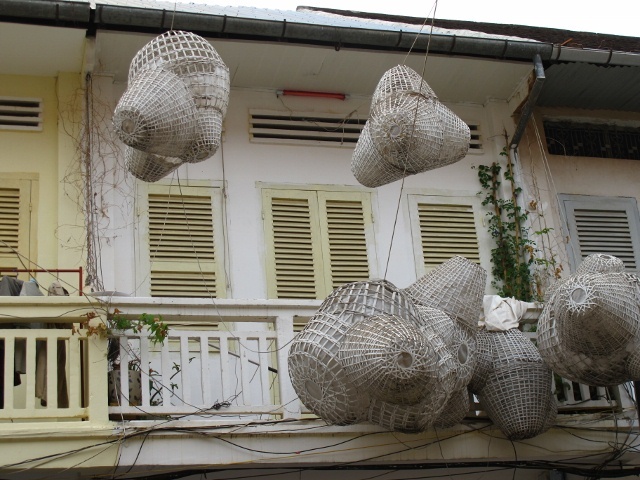 We spent the next day wandering Battambang’s streets, a town where French influence persists in its old colonial style buildings, shophouses and bakeries selling baguettes. A few, a very few, people displayed black ribbons. 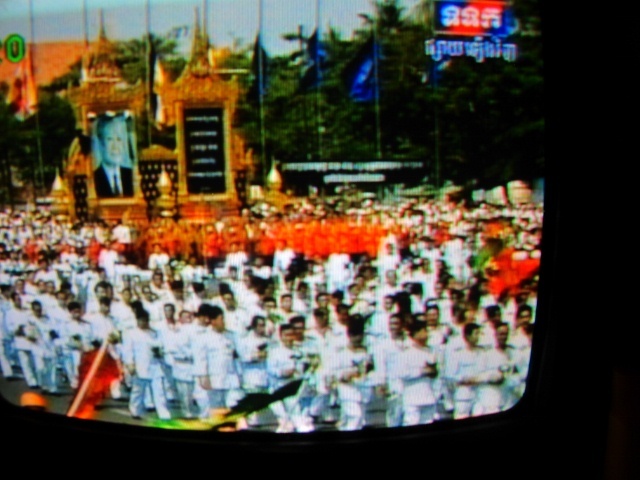 Hardly anyone wore white shirts, officially encouraged as a way of showing respect to Norodom Sihanouk. Some news organisations say 1.5 million people attended Sihanouk's cremation. 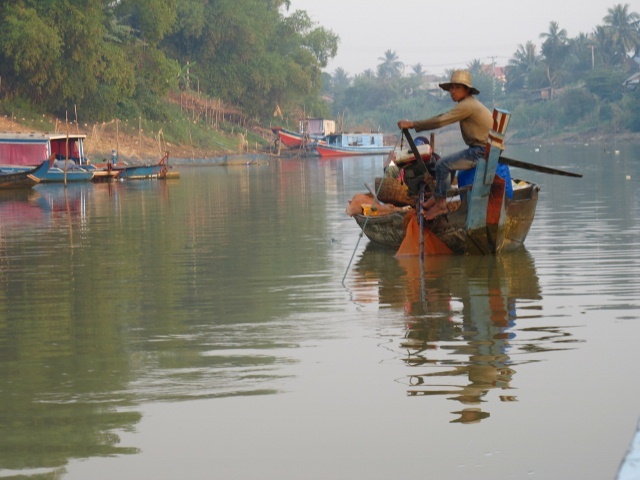 Sangker River from Battambang to Siem Reap. arrange to ship any bottles home. riverbank villages and us tourists zoomed in with our cameras. In the end, I put the camera down but other passengers armed with long telephoto lenses had no hesitation in intruding into the lives of others.